As leaves start losing their chlorophyll, you won’t want to miss the breathtaking scenery of mother nature’s vibrant painting across Stout’s Island! Columbus Day offers you a long weekend, and Stout’s Island Lodge gives you one of the best Wisconsin family getaways to enjoy some quality family time! Birchwood bursts into glorious colors in September and October, enticing visitors and residents alike onto the wondrous trails. Trust us; you’ll want to explore these trails surrounding our beautiful lodge. A unique way to experience our beautiful fall foliage is to hop aboard one of the scenic train rides for one of the greatest Wisconsin family getaways. Along with the mesmerizing scenery, you’ll also want to join in the dazzling local festivals to celebrate the harvest. While you’re here, sample our excellent fall produce. From the world’s finest apples, pumpkins, and cranberries, to the best wild rice and honey you’ve ever tasted. As you satisfy your taste buds with some local goodies, remember your beautiful room at our Stout’s Island Lodge can host many fun board-game afternoons or evenings throughout one of the most amusing Wisconsin family getaways. Delight in one of the tastiest continental breakfasts, with a variety of fresh bread and muffins, homemade pastries, as well as fruit juices and coffee. If you prefer a heartier breakfast, we recommend our Island Classic, which is made up of two eggs, potatoes, bacon, sausage or ham, and toast or English muffin, or any of our other delectable breakfast options. Most of our visitors come to forget about their demanding daily routine. We are always surprised at how quickly our guests favor the company of loved-ones over their electronic gadgets. Stout’s Island Lodge makes for some of the best Wisconsin family getaways by simply providing a peaceful gathering place. Nevertheless, we’re still amazed when teenagers leave their phones in their room to splash around the lake with their siblings! After jumping in the leaves for hours, gather around the fireplace for a family bedtime story! 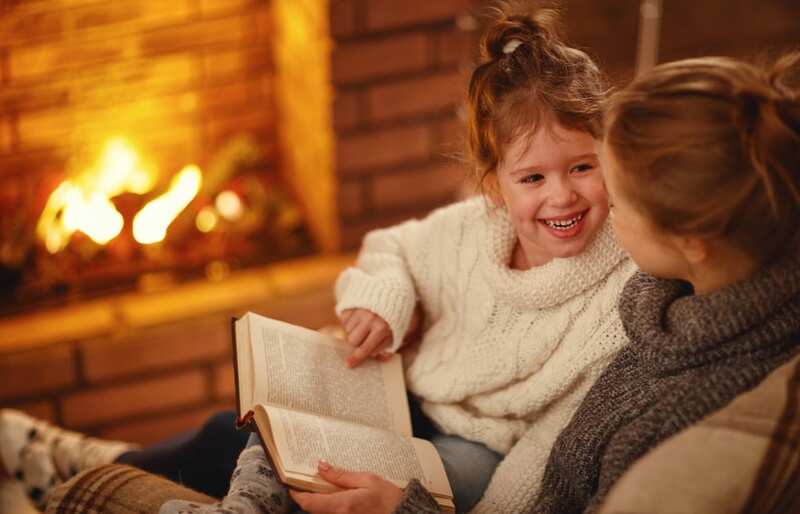 There’s nothing better than a good old-fashioned fireside story to bring the family together. The last warm days of autumn will provide a flashback of summer fun, while the cooler nights around the fireplace will start getting you thinking of warm holiday memories. Don’t miss one of the finest Wisconsin family getaways of the season by booking your Stout’s Island Lodge trip today!